I started looking for inspiration as soon as I knew I was pregnant. If it was a boy, I knew I wanted a different colour scheme to my older son's room - he has red, blue and white, - and fell in love with an avocado green room that I saw on the internet. I made up a virtual mood board for both a boy and girl of images I was drawn to, so that by the time bubs arrived, I would have an idea of what I wanted. We decided on a colour scheme rather than a theme so that we wouldn't be limited in how we could decorate the room. I wanted to decorate a special space for baby because all too quickly there will come a time where I can't control these things and he'll have posters on the wall and mess on the floor. I may as well make it look lovely while I still can! Having had two children already, we had most items ready to go. The cot and change table belonged to Stella and were just $300 for the set from Toys R Us. The white bookcase is from Kmart and this used to be in Aston's room. 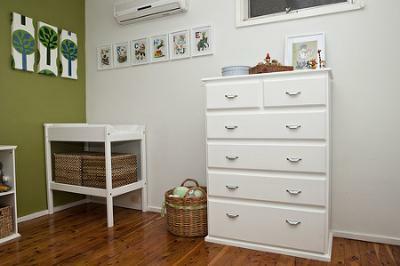 The tallboy used to be in my bedroom when I was a teenager – it was pine with knobs so we painted it white and purchased the handles from Bunnings. The framed prints on the wall spell out Archie's name – these are simply pages torn out from an old Little Golden Book. The canvasses above the wall are cheapies from discount stores, covered in Ikea fabric which was $10 per metre. The fabric cars belonged to Aston and were $10 each from the Treehouse Factory Outlet. The fabric in the embroidery hoops was sourced from www.etsy.com – another one of my favourite websites. Virtually everything else in the room was purchased second-hand at the Baby & Kids Market. I love vintage children's book illustrations, so that's how the prints spelling Archie's name came about, and these also influenced my choice of fabrics for the embroidery hoops. There are some amazing second-hand finds out there! Garage sales, op shops and markets are meccas for treasures. I love the Baby & Kids markets for clothes and toys. 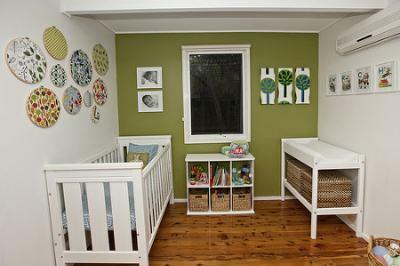 When decorating the room, there is inspiration aplenty to be found on the internet and in magazines, proving that you don't have to go to a baby store and buy an entire matching nursery set to have a lovely room.